Since I’m working on an advanced degree in English, I figure it behooves me to re-visit British history; what better way to refresh my memory than watching period-piece dramas? Of course, not all historical fiction is made alike–Elizabeth, with Cate Blanchett, takes many liberties with the traditional narrative of the Virgin Queen’s early years, although the costumes dazzle and the acting mesmerizes. So now I’m streaming the classic Glenda Jackson Masterpiece series on Netflix. What joy! And I have the use of an iPad from the university I attend. 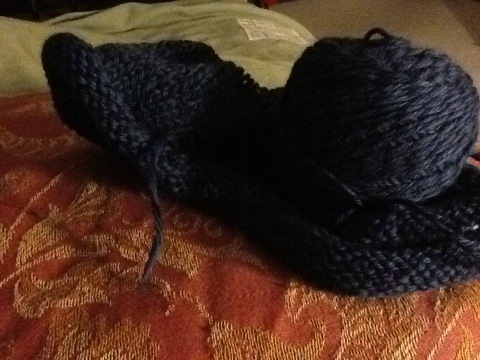 By setting it up on a pillow, I can watch in bed and knit. Nice but … you can watch that and knit at the same time?.